On January 16, 2019 local time, Special Representative of President Xi Jinping, Member of the Political Bureau of the Central Committee of the Communist Party of China (CPC) and Director of the Office of the Foreign Affairs Commission of the CPC Central Committee Yang Jiechi met with President Abdel-Fattah al-Sisi of Egypt in Cairo. Yang Jiechi conveyed President Xi Jinping's warm greetings to Abdel-Fattah al-Sisi. Yang Jiechi expressed that under the promotion and guidance of the two heads of state, China-Egypt comprehensive strategic partnership has made tremendous progress in recent years. As President Xi Jinping's Special Representative, I visited Egypt with the aim of implementing the important consensuses reached by the two heads of state. It is hoped that the two sides will maintain the momentum in high-level exchanges, continue to consolidate political mutual trust, and continue to support each other on issues concerning respective core interests and major concerns. The two sides should take advantage of such important platforms as the China-Egypt production capacity cooperation mechanism within the framework of the joint construction of the Belt and Road Initiative to accelerate promoting practical cooperation in all fields, so as to further benefit the two peoples. Yang Jiechi pointed out that last year, President Xi Jinping proposed new measures for China-Africa cooperation and China-Arab States cooperation in his speeches delivered at the opening ceremonies of the Beijing Summit of the Forum on China-Africa Cooperation and the 8th Ministerial Meeting of the China-Arab States Cooperation Forum. Egypt is a major country in the Arab world and Africa and it will soon assume the rotating presidency of the African Union (AU). The Chinese side is willing to enhance cooperation with the Egyptian side to jointly push for the implementation of relevant outcomes and elevate the collective cooperation between China and Africa as well as between China and Arab States to new highs. Abdel-Fattah al-Sisi asked Yang Jiechi to convey his sincere greetings to President Xi Jinping. Abdel-Fattah al-Sisi expressed that Egypt and China enjoy profound traditional friendship, and Egypt admires China's development achievements and values China's international status. The Egyptian side is willing to, together with the Chinese side, continue to well implement the consensuses of the leaders of the two countries, push forward the construction of the Belt and Road Initiative, deepen coordination on multilateral affairs, and continue to enhance bilateral comprehensive strategic partnership. The Egyptian side is willing to take the assumption of the rotating presidency of the AU as an opportunity to push Africa-China and Arab States-China cooperation for more mutually beneficial and win-win results. 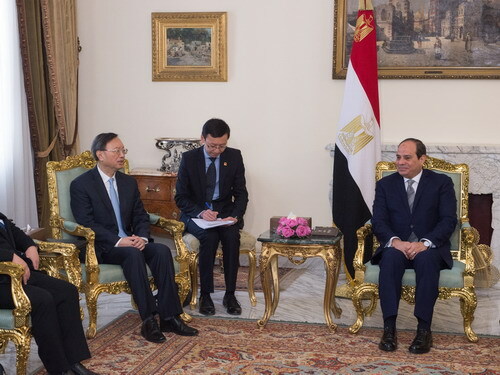 During his stay in Egypt, Yang Jiechi also met with Prime Minister Mostafa Madbouly of Egypt, National Security Adviser to Egyptian President Faiza Abul-Naga, and Secretary-General of the Arab League Ahmed Aboul Gheit.